Stress! Who doesn’t know? Whether at home or at work – its consequences, such as mental illness, have increased dramatically in recent years . Especially at work, there are many stressful factors that contribute to the dissatisfaction of employees . The work performance decreases  and in the course of this some employees may even think about a dismissal . Stress can be understood as an imbalance between the demands and the pressure on a person and the individual abilities  and coping possibilities . But what exactly are workloads? “Psychic stress is the totality of all detectable influences that come from outside to man and have a psychological effect on him” . The reasons for the development of workload are sometimes quite varied: lack of social support, social and collegial conflicts, poor work organisation, poor working conditions or lack of perceived control  are among the most frequent stressors in the working world, as are time pressure, lack of recognition or too little room for manoeuvre [8,9]. Under- and overstrain, work interruptions [10,11,12], job insecurity , role conflicts and role ambiguity  can also trigger stress reactions. Excessive work demands are one of many stress factors in the job that can lead to stress. “Mental stress is the immediate (non-long-term) effect of mental stress in the individual (…) including individual coping strategies . Employees experience stress when job requirements exceed individual performance . To adapt to the respective demands [1,16] our body reacts either with attack or flight, with anger, fear or anger or with mental coping . 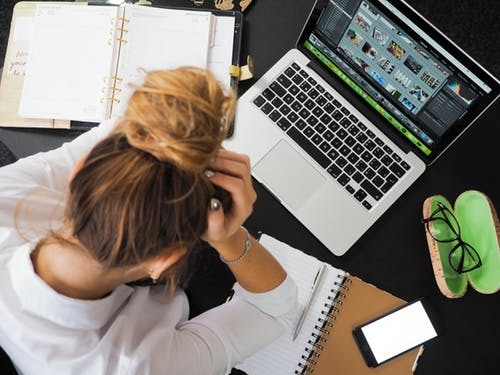 Similarly, the effect of stressors manifests itself in lack of concentration or fatigue, absenteeism, increased accident rates, counterproductive work behaviour or a reduced or lacking willingness to cooperate . Reactions to prolonged stress result in increased tension, exhaustion and irritability or serious physical health problems such as cardiovascular or musculoskeletal disorders [15,18]. All these stresses and strains describe individual components, i.e. How stress affects individuals ultimately depends on how each of us deals with (job-related) stress factors . Stress per se does not always have to be negative! As you can see, even if you experience stress, it doesn’t necessarily have to be bad. Pay attention professionally (and privately) to how you deal with stress and how you evaluate it. Can you manage a dangerous or threatening situation on your own in the long run by activating your resources and coping possibilities? Or do you need support? Because only when you can demand something positive from a stressful situation and evaluate it positively does the chance increase to deal with such situations more calmly. Identify recurring stressors – if you know which factors trigger stress in you, you can evaluate them accordingly and counteract them with your individual resources. Strengthen your resources through relaxation exercises (e.g. progressive muscle relaxation), mindfulness exercises (breathing exercises, yoga, …). Make yourself a balance to your job – fill your free time with things that do you good, such as travelling with friends, sport, but also time only for yourself can help to strengthen your mental resilience (resilience). We will be happy to assist you in recording job-related charges. Use CompanyMood to assess mental hazards and identify stress factors in the workplace. Please also read our article on psychological risk assessment.